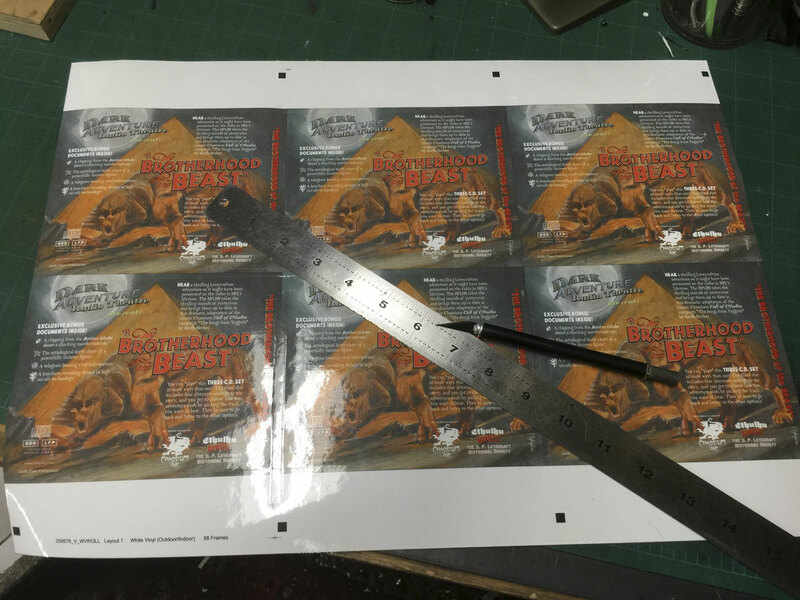 After a few minor delays from a couple of the various printers we have been working with, we are now shipping CDs of "The Brotherhood of the Beast"! The video trailer is done and online. Response has been very encouraging. We are already out of the vintage Russian bags for the Deluxe Edition and are working to find more. The 3-CD jewel cases that hold the show itself are packed absolutely to bursting. The pace of shipping will pick up as we get the hang of packing this enormous production, and we are working hard to get copies into your hands as soon as we possibly can. Downloads are now available. Thanks so much for your enthusiasm and your patience. We are curious to find out which of the four alternate endings people are choosing to listen to first, so drop us a line or post a review to let us know which one you picked, or what order you chose! One of the printing delays was with the back covers for the jewel case. Because this episode comes on 3 CDs, we have to use a different kind of jewel case that holds the third CD where usually the back cover graphic would go on the inside. So to have a back cover we are using a vinyl sticker on the outside of the jewel case, which is something we've never done before. Not only do those take a little longer to apply, but unfortunately the printer also failed to order the custom die needed to cut the stickers to the correct size, and we won't have it until Tuesday. So until then, in order to pack copies of the show we have to cut the stickers out by hand! Once we get the pre-cut stickers, packing and shipping should start to go faster. Thanks to all those who are eagerly waiting for their CDs to arrive. The next episode of Dark Adventure Radio Theatre is now at the replicator, and, assuming there are no complications, we will be shipping CDs in about a week. All the props for the Deluxe Edition are now back from the printer, so those should start shipping at about the same time. Above you can see Andrew contemplating the entire prop collection and the massive job of folding, punching, stapling, and packing that is in store! We are thrilled to bring you this very special episode and thank the many pre-order customers who helped us make it. Because of the unusual demands of preparing the Deluxe Edition, it might take us a little longer than usual to produce our traditional video trailer for the episode. We'd rather spend the available time actually getting copies of the show out to the people who have been waiting so patiently. But we're working on a fun little audio promo that we hope to release soon! The HPLHS has been delighted to be a participant in all six editions of the Stockholm H.P. Lovecraft Festival. This past weekend, I was back in Sweden to partake in an offering of Lovecraftian fun, meet with Swedish fans of HPL, and share with the Scandinavian community some of the projects that the HPLHS is working on. The festival kicked off Thursday night with a sold out movie screening at the Kulturhuset (translated poorly as “Culture Home” I suppose). The “Impaired Visibility” lineup featured Lovecraftian shorts and double feature of “The Mist” and “The Fog”. Delays at the airport kept me from being able to catch the movies, but I was happy my seat was given to another fan who could take in the mist-shrouded terrors. Friday I visited SF-Bokhandeln, Stockholm’s biggest and best science fiction bookstore and game store. The HPLHS has been partners with them for many years - in fact, they are our biggest wholesale partner in the world. I made my way through the ancient streets of Gamla Stan, Stockholm’s old town, for a lunch with Ulf Hässelbäck, our go-to guy at SF Bokhandeln. We caught up over a traditional Swedish lunch at a nice cafe in the old town. Later that afternoon, I made my way to the Kulturhuset which has been the home of the Stockholm Festival. It’s a mammoth building in central Stockholm housing the National Theatre, movie theaters, and numerous other cultural outlets. There I met festival director Anders Lundgren. After kicking off an art exhibit, I was treated to another unique element of Swedish culture. The Swedes have a sporting event which, if you can believe it, is played upon a sheet of ice. Men on skates chase a small rubber puck with sticks in attempt to drive the puck into a goal at one end of the ice. They call his game “hockey”. After a vigorous match, the home team of Djürgården was defeated by the visiting team from Linsköping. Saturday the festival moved into full gear at the Kulturhuset. The HPLHS set up a display of its wares, including the Deluxe edition of our forthcoming “Brotherhood of the Beast” in a glass display case. We sold products to discriminating Swedish Lovecraft fans. Saturday’s programming for the festival featured gaming sessions of Arkham Horror and Call of Cthulhu. We want to give a shout out to our friends at Chaosium, Inc. and thank them for donating a number of CoC books to the festival and to SF Bokhandeln for supplying even more Lovecraftian games. As the gaming day wrapped up at the festival, we moved on to the Queen’s Head pub for a Lovecraftian Trivia game. In a basement room, five teams squared off, facing each other and a daunting set of 30 questions written by Anders Lundgren and me. Over food and beer, memories were put to the test. We’re pleased to say that the winning team consisted of the one-man team (well, maybe one and a half, as his wife provided moral support) of Lewis Evans - a longtime HPLHS member who made the trip up to Stockholm from his current home in Germany. Lewis won the grand prize - a bag of swag provided by Chaosium, SF Bokhandeln and the HPLHS. Second and third runners-up teams also received packages of fabulous prizes. 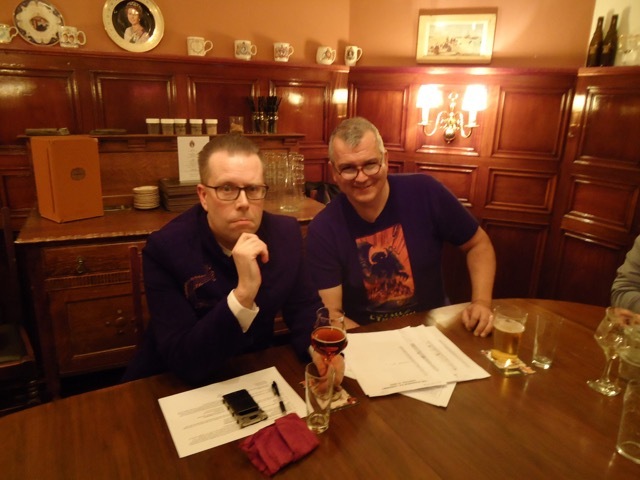 The trivia quiz proved to be one of the festival’s highlights - an international gathering of like minded Lovecraft fans bonding over beer and ruminating over the names of Lovecraft’s aunts. Sunday, the festival was back at the Kulturhuset. 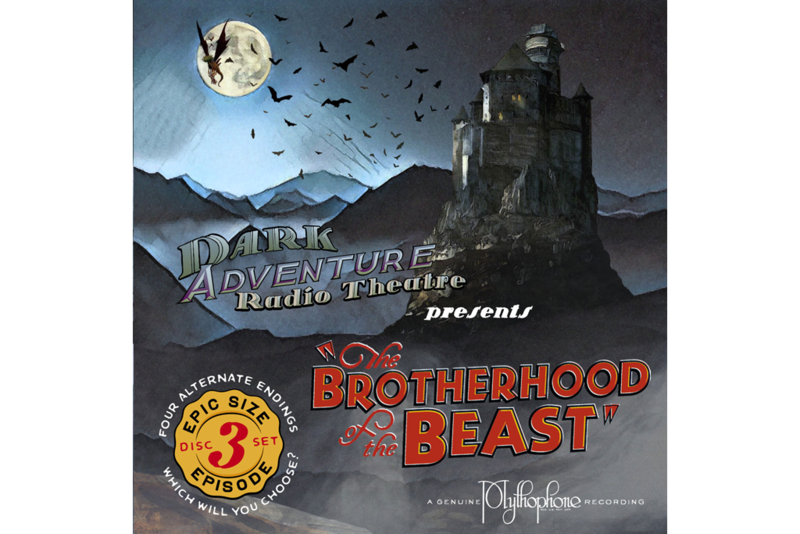 Programming featured a sneak preview of the HPLHS newest Dark Adventure show, "The Brotherhood of the Beast". 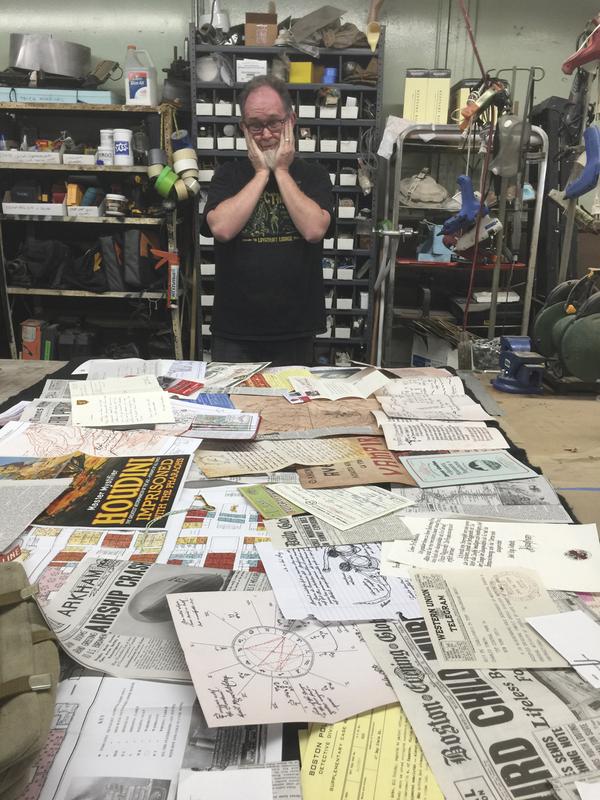 A number of HPLHS members were on hand to hear the beginnings of the new show and see the prototype of the Deluxe Prop Collector's Edition on display. After the preview, Anders and I talked about the new show, the challenge of adapting a role playing game into a dramatic radio play and took questions from the audience. The day wrapped up with more sales at the Bazaar of the Bizarre and the sixth Stockholm H.P. Lovecraft Festival came to a close. The Festival in Stockholm is a small event compared to Providence’s NecronomiCon or the HPL Film Festival in Portland. But even with its smaller size, it draws a crowd of enthusiastic local fans (and some unwitting innocents who wander in) who show a keen appreciation for all things Lovecraftian. We hope this event will continue to thrive and help Lovecraftian fandom grow throughout Europe. 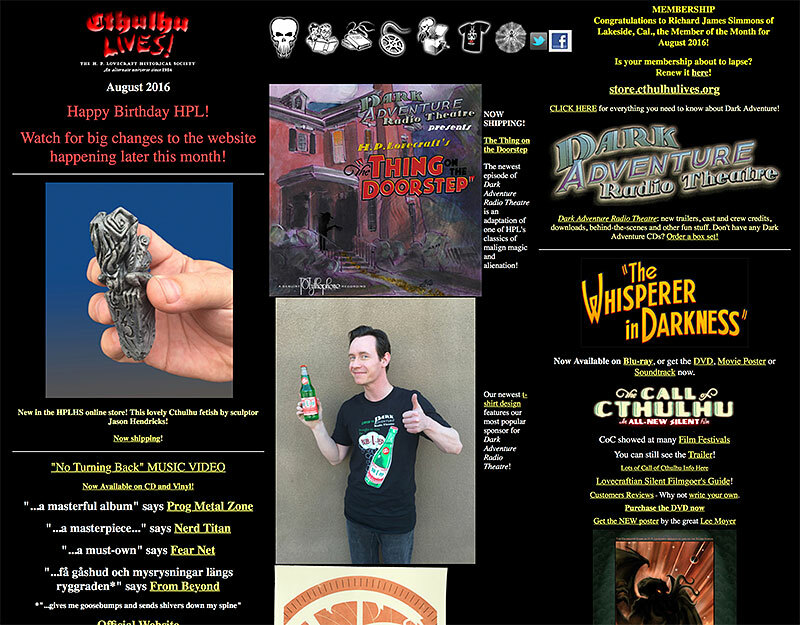 You may notice that the HPLHS website has a completely new look. The site has been a work in progress since the earliest days of the internet, and as it has grown over the years, some sections have become very dusty and neglected. Longtime society member Jamie Anderson is helping us finally to take advantage of some of the latest in CSS and other web standards. We have a lot of content to offer you, and some sections of the site may be offline for a while until we have a chance to get it all up to snuff, or you might find links to older sections that still need to be reworked. We're very excited about the overhaul, and hope you'll find it easier and more pleasant to browse through all the many images, videos, PDFs and sound files we have. Please check back for new sections as they come online, and if you discover issues, errors, or other problems with the new site please feel free to notify Andrew. We will appreciate constructive feedback that helps make the new site as good as it can be. Join Sean Branney, Andrew Leman and shipping shoggoth Kevin Stidham at the H.P. Lovecraft Film Festival in Portland October 7–9 at the historic Hollywood Theater! We'll be doing a LIVE stage performance of Dark Adventure Radio Theatre "Dagon: War of Worlds" and participating in a number of panel discussions. Members can meet Kevin and collect bonus stamps at our merchandise table. 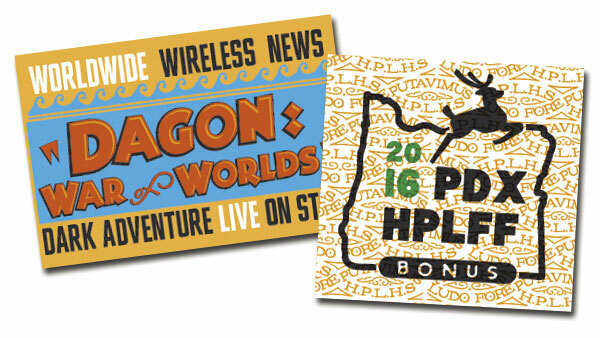 For the schedule and other details visit the official HPLFF website.